The early part of November will go in Copenhagen and US. Reaching Copenhagen by Nov 2 to shoot for the second part of the series with CNN. I finished the first part on Saturday. And the third part is expected to be shot in Delhi later in the month. Will be cooking and shooting with Chef Rene Redzepi of Noma restaurant in central Copenhagen. Noma is a two Michelin star restaurant known for its reinvention and interpretation of Nordic cuisine. Looking forward to this little adventure immensely as I will be learning a whole lot of new things! Chef Rene has earlier worked with The French Laundry and El Bulli. 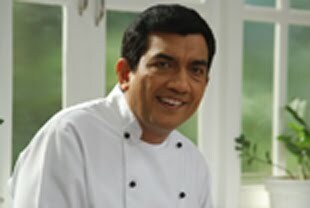 He is known to serve soul food cooked with local fresh produce. After this, I am off to Houston and San Francisco for live shows on Nov 5 and 6 to promote my food business. Spending a day post this in New York and then flying back home. Many of you have enquired about what to cook for Christmas and New Year! Yes, your search for new recipes should begin now as any festival is the perfect occasion to serve novel foods. I have been writing about Christmas treats last month and now it is down to the brass tacks, as they say! Yes, the fruits should be soaked in rum now for the cakes and puddings. I will get to see the festive preparations for Christmas when I travel to Denmark and US and will definitely get back for you the newest fare. I will soon have for you all the recipes that were contributed to the Innovation Station Competition. Maybe they could give you some ideas for the coming season. 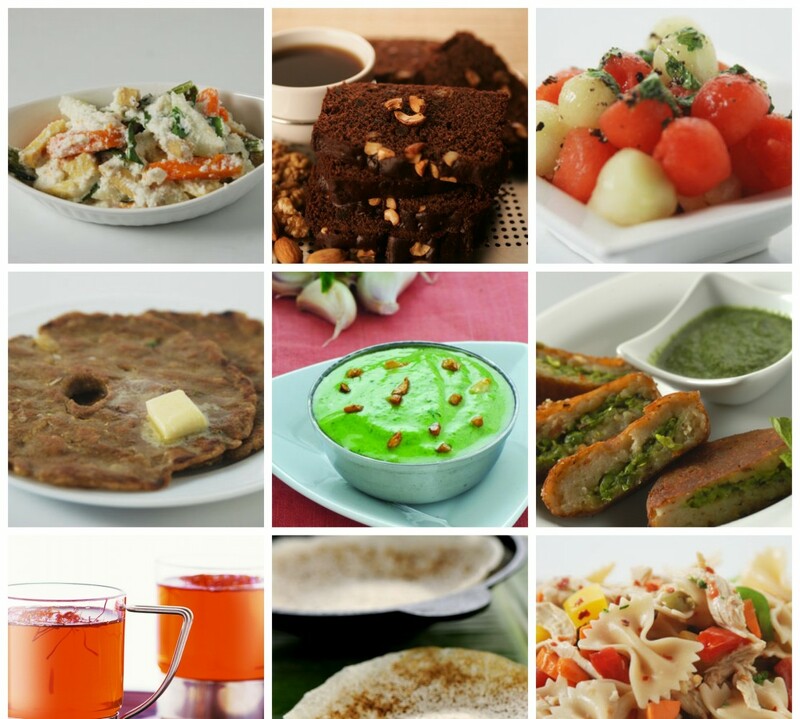 Right now, let us focus on some recipes that can balance out the meals at home after all the festive Diwali treats. So how about going light and low cal? Well, yet another Diwali has come and gone, but the taste of our innovative Diwali treats lingers on! The festivities had begun with full gusto and they ended with a keen competition amongst four teams that cooked to their hearts’ content for the Innovation Station. Began the week with a havan, and it was really peaceful and tranquil after the chants and prayers got over. st all the creativity dished out before me! All the teams were in full form to make their dishes and it was quite difficult to decide the winners. But the team that was a stand-out performer of course won! They made a starter called Soya and Suran ka Jhatka. The main course was Jugalbandhi Tokri with Kedegree and the dessert was Pachim Falooda Mousse. Team members – Satyaki Mukherjee, Dilpreet Kohli, Nisha Dingra, Sheetal Kadam and Rohit Mangela – well done all, and congratulations! You can see the creations in the pictures and in the same space I will be sharing their recipes soon. Diwali was different this year around and I hope my team keeps honing their skills all through the coming year. So with all this fun and amazing food set before us, how about using these traditional recipes for the weekend guests? Christmas dessert recipes are high in demand! Well, there is no dearth of them! With Diwali too around the corner, it is truly a time for creating sweets, mithais and desserts, isn’t it! Following these paras you will find some baked Christmas Dessert Recipes that you should be able to get right even on the first attempt. Baba au Rum: Sieve 2 cups refined flour with 10 grams salt and put it in a big mixing bowl. Mix 10 grams fresh yeast with 1 tablespoon sugar in one-third cup of lukewarm water. Make a well in the center of the flour mixture and add the dissolved yeast, stir a little, cover and let stand five or six minutes. Beat 4 eggs and add them to the flour and yeast mixture. If necessary add a very little warm milk. Mix well and keep aside to rise for about thirty to forty five minutes in a warm place.Then add 10 tablespoons melted butter and beat again for five minutes. The batter should not be thin. Put the batter into moulds or individual cups, cover and leave to rise in a warm place until it doubles in size which may take about one hour. Preheat oven to 180 degrees C. Bake for about twenty to twenty-five minutes or until light brown in colour. Empty onto a rack to cool. Make a sauce by boiling half cup of water and ½ cup of sugar until quite thick. When cool thin it down ½ cup strong black rum, pour this sauce on the cakes and let them soak for fifteen minutes. Garnish with rum soaked cherries, serve cold or flambéed. Baked Carrot and Brandy Pudding: Preheat oven to 175 degrees C. Butter and flour a 20-cm round glass cake pan. Peel, wash and grate 3 large carrots. Cream ¾ cup butter until fluffy. Beat in 400 ml condensed milk. Beat in 4 eggs one at a time. Stir in carrots, 1 cup dry breadcrumbs and ¼ teaspoon vanilla essence. Mix well. Pour into prepared cake pan. Bake at 175 degrees C for thirty to thirty five minutes or until a knife inserted in centre comes out clean. Cool completely in pan or on a rack. Bring 2/3 cup sugar and quarter cup of water to a boil in a small saucepan. Boil for two minutes. Remove from heat, stir in ¼ cup brandy. Cool slightly. Spoon evenly over cooled carrot pudding. Refrigerate for one hour. Cut into wedges and serve. Christmas Desserts are something that can use some rum or brandy. So when it comes to these ingredients, hope you liked the two yummy choices given for you. In case you would like something without spirit, try these for sure Walnut Chocolate Fudge, Vanilla Sponge with Fruit Cream, Boondi and Rabdi Stuffed Pancakes. If Diwali is around the corner, can food and fun be far behind! My team is excited about the challenge thrown to them…create an innovative Indian dish in under 2 hours! This is on coming Tuesday. Will also be having a havan on next Monday. Long time since we have had one in the office and so it will be a good thing. Then some break from work for everyone! Last week, spent some time in Aurangabad giving a demonstration of recipes at the MGM Institute of Hotel Management. Yes, my new offering was a hare choliye ki pani puri! 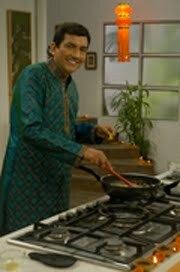 So what is cooking this Diwali! Tell you, there is hope in the air as even the rising prices have not been able to dampen the festive spirit. The markets are aglow with sale of diyas and electric lahrees, the saree shops seem to be always packed (!) and soon we will see the same rush in mithai shops…. Wherever you turn, you witness some innovation in the food offered to you. The palate is growing at such a fast pace that restaurateurs are on their toes! 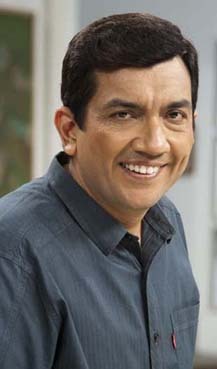 People want new foods, new tastes and textures and I really think this is time that food is shining in India. But let us not forget the traditional greats. If we do not make them at home, how will our children learn about them and continue cooking them for the future generation? I urge you to write down all your grandma’s recipes, your mother’s recipes, your mother in law’s recipes, your elder sister’s recipes, your aunties’ recipes….whatever you can get hold of…because soon we will be floundering under so many fusions and innovations that our great cultural heritage will be ignored. I do take documentation quite seriously and hence so many books. Have you seen the latest book Cooking with Love which carries food cooked by my mother and mother in law? It is a cherished treasure for me. So, as the mood goes, let us look at the good old home made Diwali treats. Go for them! Christmas Dessert Recipes are the best way to dedicate your meal to the festive season. Desserts not only mark the end of a meal but also are the highlight of any celebration. Christmas Dessert Recipes will, of course, feature the traditional Christmas Cake, Christmas Pudding and cookies. But going with the fads, let us also use some fresh fruits to make some delightful puddings and desserts. Also, as we all know it, chocolate is on an all time high. So what about going through some Chocolate and Prune Pudding and Chocolate Marquise. Those who love some liquor who definitely adore the Bailey’s Ice cream Mousse. For fresh fruit ideas, let me run you through some simple puddings using apple and banana. In this, apples and strawberries covered with oats and wheat flour with brown sugar to make a healthy dessert. Preheat the oven to 190°C. Core 2- 3 medium apples and chop roughly. Put them in an ovenproof dish. Slice 15-20 strawberries thinly and add. Sprinkle 2 tablespoons sugar and mix and let it stand for sometime. Place ½ cup rolled oats in a bowl. Add 2 tablespoons whole wheat flour, 1 teaspoon cinnamon powder and 3 tablespoons brown sugar and mix. Add 2 tablespoons chilled diced butter and mix with finger tips so that it resembles bread crumbs. Spread this mixture over the fruits in the dish. Place it in the oven and bake for about twenty minutes. Serve warm. This is an ideal teatime cake with the goodness of whole-wheat flour. Preheat oven to 180 C. Grease and line a nine-inch by four-inch loaf tin. Sieve ¾ cup whole wheat flour, ¾ cup refined flour, 2 teaspoons baking powder, salt, ¼ teaspoon cinnamon powder and 1/8 teaspoon nutmeg powder. Cream 200 grams butter and 1 cup brown sugar together in a bowl till light. Add 2 medium mashed bananas, 1 teaspoon vanilla essence and mix. Beat 3 eggs with a hand blender till light and fluffy. Add one third of the flour mixture to the banana mixture. Add one third of the beaten eggs and mix with a light hand. Again add one third of the flour and one third of the eggs and mix. Add the remaining flour, ¼ cup chopped walnuts and the remaining eggs and mix. Add 2 tablespoons milk to correct the consistency of the batter. Transfer the batter into the prepared tin and place it in the preheated oven. Bake at 180 C for about thirty minutes. Check if it is done by inserting a skewer. If it comes out clean it is done. If not, keep the tin back in the oven and bake for another five to ten minutes. Turn over onto a rack and cool before slicing. You can serve this cake hot or cold. Christmas cookie recipes are really fun to share! Not only can you get some good Christmas cookie recipes from books, magazines and sites but also from friends and family members who you know are crazy about baking. So this Christmas not only make some of your favourite cookies, but also some really different ones like Oatmeal and Raisin Cookies, Crunchy Peanut Cookies and Honeyed Fig and Walnut Cookies. For the easiest and the most festive delight, follow this recipe: Preheat the oven to 170°C. Grease a baking tray. In a bowl mix together 2 cups refined flour, a pinch of salt and ½ teaspoon baking powder and set aside. In another bowl beat together ½ cup butter and ¾ cup sugar until light and fluffy. Add 1 egg and1 teaspoon vanilla essence and beat until well combined. Add the flour mixture and mix to make a smooth dough. Cover and refrigerate for an hour. Remove the dough from the refrigerator and roll to a thickness of a quarter inch. Cut the cookies into desired shapes with cookie cutters. Place them on the baking tray keeping a little distance between each. Bake the cookies for ten minutes or until browned around the edges. Take the tray out of the oven and set aside to cool. To make the icing, sieve 1 cup icing sugar. Cream ½ cup butter till soft in a bowl. Add icing sugar a little at a time and beat. Add ½ teaspoon vanilla essence and continue beating till light and fluffy. Decorate the cookies with the icing and glaze them with jam. Christmas cookie recipes are best written down and stored for posterity once you have hit upon the perfect working recipe for you. Cookies not only make any time snacks but also make a fantastic post meal event with some coffee. It’s Monday, and after quite an eventful weekend with lots of happenings, starting Friday itself…it’s shooting time again! 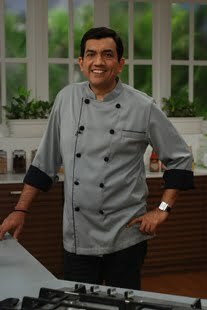 Beginning with an all new Sanjeev Kapoor’s Kitchen Delmonte series shoot today which will go on till October 14, 2011. The channel sure has made these shoots hectic, but it’s fun working like this with all the fresh aspects added to the shows! Friday had me lunching at DimSum&More, at Versova, with food critic and blogger Rashmi Uday Singh, which was followed by a dinner at home with some eminent personalities like Gurudas Kamat, Baldev Khosa, Siddhartha Khosa amongst the others. The highlight of the dinner was a discussion on ‘Kopi Luwak’ – basically of the Indonesian origin, which is known to be one of the most expensive and low production coffee varieties in the world. I happened to share a story about the same and we all ended with a hearty laugh, a great light-hearted dinner I must say! Also, had meetings with senior Congress leaders after dinner, where I got the privilege to invite Prithviraj Chavan for a dinner at home! Then came Saturday, where I had some mixed Indian and Chinese food for dinner at Club Millennium with family including my mother and in-laws. Sunday was fun day with a picnic lunch with family, followed by attending a Mata ki Chowki at a friend’s place and dinner to end with! All in all a pretty busy schedule packed with some overdose of jalebis the entire last week. So, I’ve decided that no more of those extra calories for the next few weeks, atleast till Diwali!